Above: Ann McDaniel checks out the new green trash cans on display in the Wolman Building today. It’s not quite the same as Oprah Winfrey giving a car to every person in the audience. “Baltimore City Will Deliver One Free Municipal Trash Can To Each Single-Family Household That Receives Trash Collection,” promises a mailer that the city sent out this month to announce the one-time giveaway. “CAN DO!” is the slogan for the program, which is administered by the Department of Public Works. The program was funded last November, when the city’s Board of Estimates approved $9 million to purchase about 210,000 trash cans from a North Carolina company, Schaefer Systems International. Under the program, the city will provide the dark green cans, made of “durable resin,” to eligible households around Baltimore. The cans will have a tight-fitting lid, two wheels and handles. They will come in two sizes, 35 gallons and 65 gallons. They have a value of about $42. So as a city resident you CAN receive one of these new receptacles, but must you? Amid concern from some residents as the deadline to opt-out of this mandatory gift neared, the city today announced some changes, including moving the opt-out deadline. Now residents have until April 20 to formally assert that they don’t want one of the new cans or that they prefer the smaller one. “I think by and large it’s been positive,” said Jeffrey Raymond, spokesman for the public works department, when asked about the overall response. Raymond, who has been meeting with communities throughout the city, said he has found that most people are receptive to the program. Raymond explained that the program was started primarily to help make neighborhoods and waterways cleaner. Other reasons for paying $9 million for trash cans, according to DPW, is to reduce the rat population, reduce strain on workers, make trash collection more efficient, ease alleyway litter, cut down on theft, and improve garbage management by monitoring individual can usage. Raymond said a pilot program in 2014, in which two neighborhoods tried out the cans, showed that they can make a difference in making an area cleaner. Raymond said the distribution will start on March 1 and continue until the summer. By then, he said, every household should have received its trash can. The first neighborhoods to get them will be the two that took part in the pilot program: Greater Mondawmin on the west side and Belair-Edison on the east side. The city will “work outward from there,” Raymond said. City employees will put door tags on properties approximately 10 days before cans are delivered, to alert residents they are coming. The city will also post delivery updates online. Cans will be delivered to the front of the house. They can be used as soon as they arrive. Days of collection and pickup locations will not change. These trash cans do not take the place of recycling cans. People who use recycling cans are encouraged to continue recycling, Raymond said. The new trash cans will remain the property of the city. One reason for doing it that way, Raymond said, is that it means there will be no additional cost to residents. Another reason, he said, is that the cans will remain at the address if the occupants move away. These are so-called “smart” trash cans, meaning they are equipped with radio frequency identification and tracking tags and serial numbers. Residents are advised to make note of the serial number of their cans. The city is also suggesting that residents tie a ribbon or a tag on their cans to identify the owner, just as travelers tie a ribbon or tag to luggage at the airport. 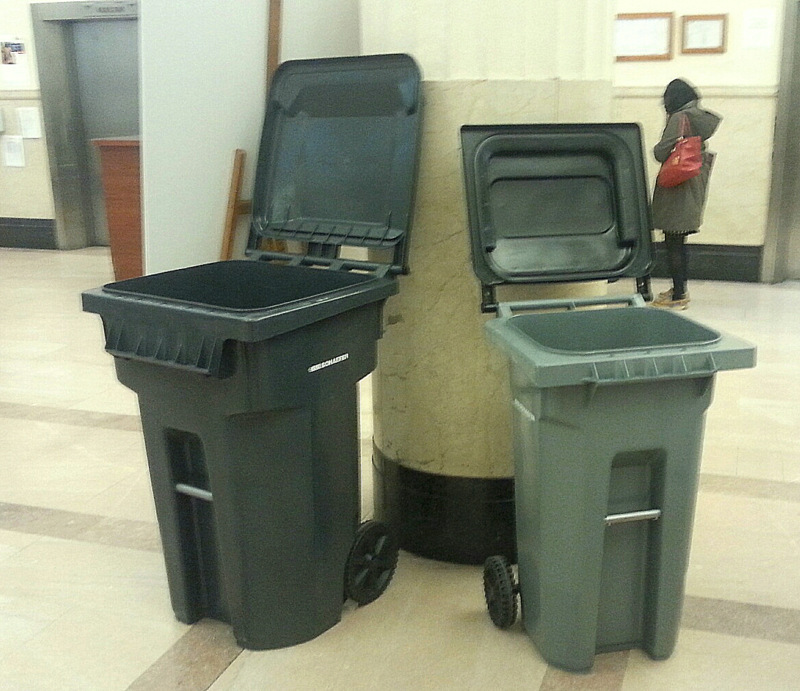 Is the new program part of a plan to eventually charge residents for trash collection? Turning trash collection into an “enterprise fund” and charging a usage fee similar to water and sewage consumption was recommended in the “Ten-Year Financial Plan” commissioned by the mayor in 2013. The cans are expected to last 10 years. They come with a warranty for that length of time. What if the cans become damaged? The city, he said, will replace the cans free of charge under certain circumstances. Generally, cans that are damaged through general wear and tear will be replaced at no cost to the resident. But in certain other cases, the city will charge a “restocking fee” to make a replacement. For example, the fee may be charged in cases where cans have been “abused.” Raymond said he does not have the figure for the restocking fee, but it will be close to the city’s cost. The cans will bear the seal of Baltimore. Residents are asked not to write on them. Most households will receive a 65-gallon can, but certain households can request a 35-gallon can. How to get the smaller can? Initially, the city said the households eligible for a 35-gallon can are those that 1) occupy a row house that is part of a block-long group, 2) have trash collected in front of the house rather than in the back, and 3) Have no exterior storage space. As of today, DPW has lifted the “lack of external storage space.” Residents who want the smaller can must still meet the two other requirements. The deadline for requesting 35-gallon cans is April 20, but the sooner the better, Raymond said. Requests can be made by calling 311. Residents can also opt out of the program entirely and use the cans they use now. This may be an option for people who find even the 35-gallon cans are too large. Raymond said he doesn’t have a figure for how many people have opted out so far. 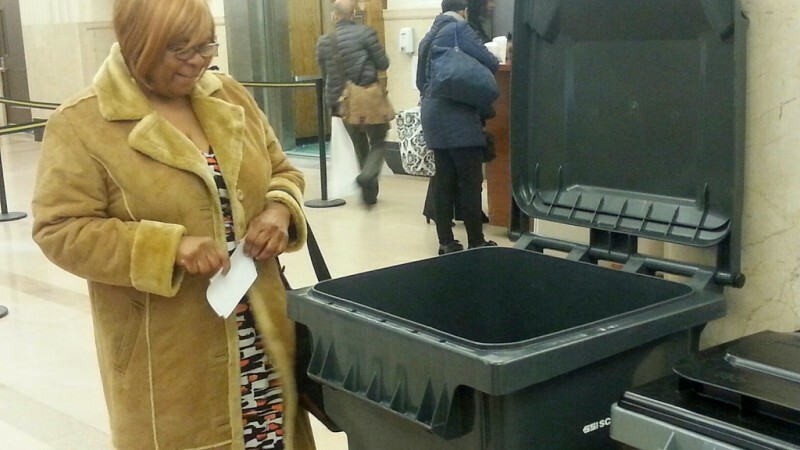 The deadline for residents to notify the city they want to opt out is April 20.